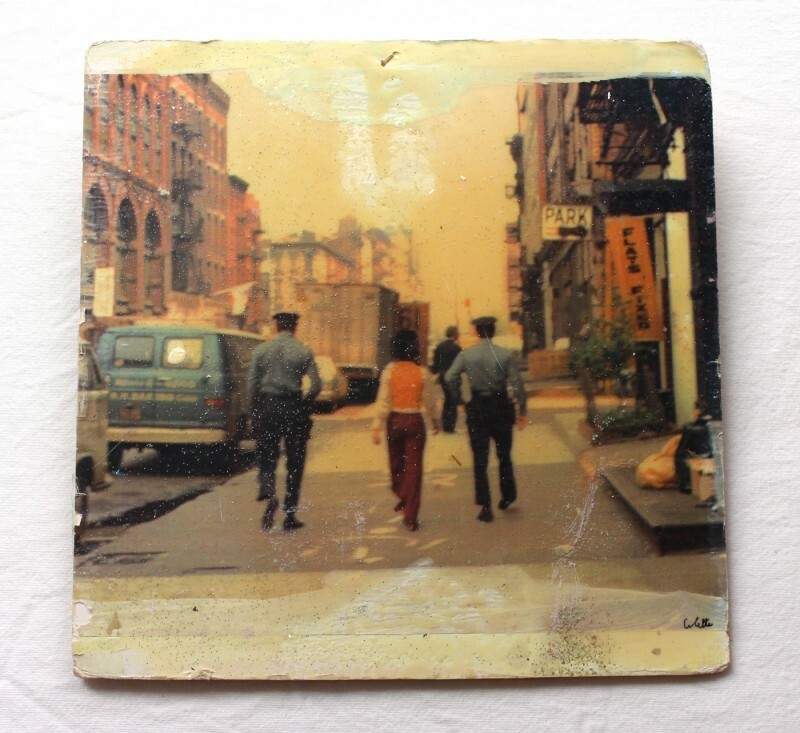 “Street Work I Series, West Broadway Soho, Being Taken Away by Police,” 1973. Mixed media on foamcore, 12 1/4 x 12 1/4 in. 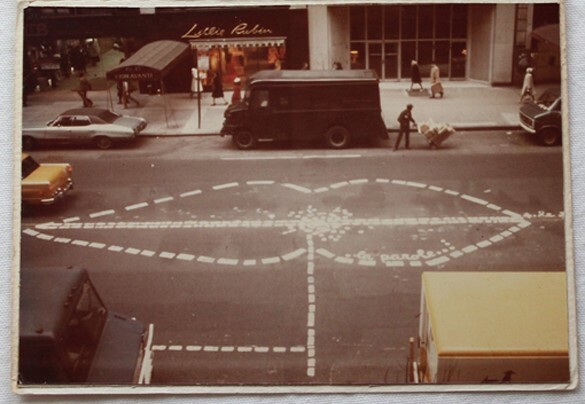 In the early 1970s, the idea of creating art directly on the street was in the air. We mostly remember the tags that covered New York’s buildings and subways, done in black ink marker by kids growing up far from the art world. But at the same time a different sort of art was appearing on the streets of Soho and Tribeca, artists’ neighborhoods filled with galleries and cognoscenti. These elaborate markings, done with paint rollers, were the work of Colette, an artist inspired by earth works and immersed in avant-garde traditions. While the early graffiti writers paved the way for the ambitious top-to-bottom subway art that would later spread throughout the world, Colette’s illegal art found a lineage in the unbroken stream of art students who would reject galleries in favor of the urban canvas and its wide audience. City officials saw no difference between Colette’s art and the tags they were trying to eradicate from the subways. Colette was harassed by the police, and her works destroyed. These works live on only in the elaborate documentation that she created, using photographs that she sometimes “Coletticized” with paint, glitter and glazes. Colette would later become one of downtown’s pioneering performance artists, keeping in touch with the public by using unconventional spaces like the window of the fashion boutique Fiorucci. Today we can put her work side-by-side with that of the taggers and aerosol artists, a rare connecting point between the cultural revolutions taking place uptown and downtown. “The Ear, Street Piece I #8,” 1973. Photograph, 5 x 7 in.